Islam Around Us: Egypt bombs IS targets in Libya after beheading of 21 nationals. Egypt bombs IS targets in Libya after beheading of 21 nationals. CAIRO | AFP | 17 Feb 2015 : : Egyptian jets bombed Islamic State targets in Libya on Monday, a day after the group there released a video showing the beheading of 21 Egyptian Christians, drawing Cairo directly into the conflict across its border. Egypt said the pre-dawn strike hit militant camps, training sites and weapons storage areas in neighbouring Libya, where civil conflict has plunged the country into near anarchy and created havens for armed factions. “And let those near and far know that the Egyptians have a shield that protects and preserves the security of the country, and a sword that eradicates terrorism,” the military said. Egyptian state television aired footage of fighter planes leaving a hangar with “Long live Egypt” emblazoned on the tails, followed by night-vision aerial footage showing bomb explosions and the aircraft returning in early daylight. Libya’s air force also participated in Monday’s attack, which targeted Derna, an eastern coastal city seen as a base for Islamic State fighters in the oil-rich nation. “There are casualties among individuals, ammunition and the (Islamic State) communication centres,” Libyan air force commander Saqer al-Joroushi told Egyptian state television, adding that dozens were killed. Joroushi, who is loyal to Libya’s internationally recognised government that set up camp in the city of Tobruk after losing control of Tripoli, said there would be more strikes on Tuesday. The rival Tripoli-based parliament, which is supported by some Islamist groups, said the strike was an assault on the country’s sovereignty. Omar al-Hassi, the premier of the self-declared Tripoli government, said three children, two elderly men and a 21-year-old woman were killed in the attack. It was not possible to confirm either factions’ accounts of the number or nature of the casualties. CHRISTIAN ANGER: Cairo called on the US-led coalition fighting Islamic State in Iraq and Syria to broaden the scope of their operations to include Libya, highlighting how the militant group has expanded its reach around the Arab world. The US military estimated in December that only around 200 Islamic State fighters were operating in the country. Egypt is not the only Arab nation sucked into confrontation with the group by the gruesome killings of its citizens. The 21 Egyptian Coptic Christians were marched to a beach, forced to kneel and then beheaded on video, which was broadcast via a website that supports Islamic State. Before the videoed killings, one of the militants stood with a knife in his hand and said: “Safety for you crusaders is something you can only wish for.” Afterwards, he says: “And we will conquer Rome, by the will of Allah.” The head of the Roman Catholic Church, Pope Francis, condemned the beheadings. “They were killed simply for the fact that they were Christians,” he said at the Vatican. “It makes no difference whether they be Catholics, Orthodox, Copts or Protestants. 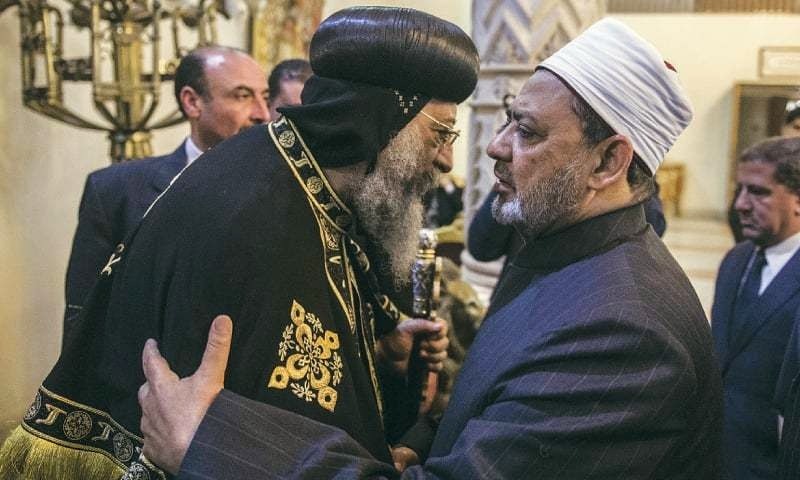 They are Christians!” Egypt’s Coptic Christian pope was one of the public figures who backed Sisi when he, as army chief, ousted Islamist president Mohamed Morsi in 2013 after mass protests against him. France has said Egypt will order 24 Rafale fighter jets, a naval frigate and other equipment in a deal to be signed in Cairo on Monday worth more than 5 billion euros ($5.7bn).